A disc containing personal and protectively marked material relating to the Rosemary Nelson Inquiry has been lost. The inquiry said it was working with the PSNI and other agencies to ensure that any risk to individuals has been "assessed and minimised". Secretary of State Shaun Woodward has ordered a review to ensure the inquiry is complying fully with procedures. Police launched an investigation, but it is believed the disc was not stolen. The inquiry said it deeply regretted "this serious breach of secure data handling protocols". The compact disc went missing on 6 May. In a statement, the inquiry said: "Given the nature of the information, it would not be appropriate to say more about the material involved. "Immediate steps have been taken to avoid any recurrence and a comprehensive review of all aspects of data handling has been initiated. "The inquiry is determined that the incident should not in any way compromise or impede its investigation into the circumstances of the death of Rosemary Nelson." Northern Ireland Secretary Shaun Woodward said there had been a "serious breach of data handling protocols". "The government has made clear to the inquiry its grave concerns about the breach of the detailed agreement it has with the inquiry on the handling of data," he said. "As soon as we were made aware of the loss, the government instituted all necessary steps to meet its obligations." 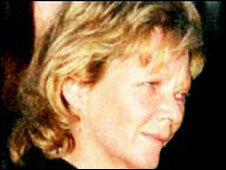 Mrs Nelson, 40, died after a booby-trap bomb left by loyalists exploded under her car in March 1999. Retired judge Sir Michael Morland is chairing a three-strong panel examining alleged security force collusion. Under its remit, the inquiry must determine whether the Royal Ulster Constabulary (RUC), Northern Ireland Office (NIO), Army or other state agency facilitated the murder, or blocked attempts to investigate it. The collusion allegations arose because of Mrs Nelson's role as the legal representative in a number of high profile cases, including that of the nationalist Garvaghy Road Residents' Coalition in Portadown. More than 100 witnesses, including the soldiers, are expected to give evidence to the three-strong panel chaired by Sir Michael. The inquiry, which opened in 2005 to set out its terms of reference, has already gathered tens of thousands of documents. Established by former secretary of state for Northern Ireland Paul Murphy in November 2004, the hearings could last for at least two years. The inquiry panel is also comprised of Dame Valerie Strachan, former chairman of the board of Customs and Excise, and Sir Anthony Burden, former chief constable of South Wales Police.